Now you have found your way to COBRA LOUNGE... good work. Now you are inside Spoonman's Dream... good luck. COBRA LOUNGE, for modern times, first appeared in San Francisco in 1987. Hosted by SPOONMAN, (lower volume) along with his venomous consort COBRA WOMAN, in its brief storied existence, it offered a wicked and otherworldly vaudeville showcase for over 200 performers, artists, musicians, and technologists. For eight years, mysterious and sold-out eruptions regularly invaded various venues around the Bay. In 1994, secure that a melt-o-media wave of solo performance and improvisation, new puppetry, digital arts, and Dionysian humor had been irreversibly set in motion - COBRA LOUNGE folded its tent and disappeared into the night. In the now not too distant past it was, COBRA LOUNGE would arise from nothingness. Spoon call would go out and a commie-unity of action would begin to "cobrasize" the real world, and resurrect steaming and slinking powers of fat fun. Get on board, or get out of the way. Art, like love, had to have its day and its night. Plenty of artists, dancers, musicians, designers, at once analog and digital, wholistic and hellacious; one big mediated pagan love fest designed to break through the dull walls that keep us in shrink-wrap life. SPOONMAN: "You get up this morning, good, you are lucky, some people did not. You eat granola, fried eggs, six cups of coffee, and you think maybe, just maybe you are ready for day. But then bus is late, cat gets locked in refrigerator, and you think maybe there is another life, close to this one, but not too close. That is what COBRA LOUNGE is, close to this life but not too close. COBRA LOUNGE is to old-fashioned variety show like first day of summer vacation is to 7:30 am, Monday morning, February in Albania." 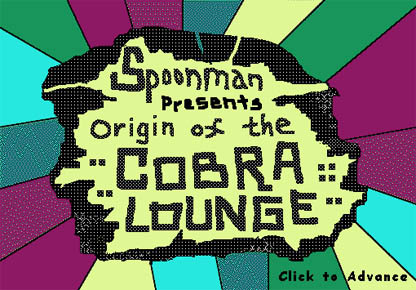 Some people think Spoonman is inventor of COBRA LOUNGE. Not so. References to COBRA LOUNGE are scattered throughout Old Testament. It was early appearances of COBRA LOUNGE that helped slow down Spanish Inquisition, and more recent occurences have provided much needed relief from inane virus of real-life. No, COBRA LOUNGE is as young as real-imagination and as old as good booze and high heels. In case you haven't noticed, past has taken shortcut to head off future at point in time coming up soon. When time comes, and past and present merge, it would be better for everyone if they were inside COBRA LOUNGE. Entire set is ready to convert into giant airbag that can then be used as sturdy floatation device. Cyber Foot Quintet knows how to improvise through natural disaster. Cobra Woman will make sure we stay supplied with food, power, and moisturizing lotion, while I, Spoonman, will maintain radio contact with alien civilizations, which when they see flood of beauty and talent hereabouts, will no doubt say, "The rest can go to hell, but this COBRA LOUNGE thing, we got to save." So, relax, if end of world should come anytime soon, COBRA LOUNGE is safest place to be. This morning Spoonman trip over shoe that dog has chewed up. Old shoe makes dog happy. Ride in backseat makes hitchhiker happy. Line drive double down right field line makes baseball player happy. COBRA LOUNGE makes Spoonman happy. Maybe you too. If not then I say, go and find what makes you happy, and if it is more fun than COBRA LOUNGE, you call or send e-mail (spoon@well.com), and we will be there soon.